It has been a long day. My flight left this morning at 11:35 and landed in Orlando at 2:00. Between daylight savings time and the flight into the Eastern time zone, I lost 2 hours today. The flight was smooth, but the plane was small and crowded. Cody (my co-worker) and I watched Saw II while waiting to board and then we finished on the plane. It was good, but I liked Saw better. A couple of U-turns later, we found our hotel and checked in, then headed to check in at the conference. 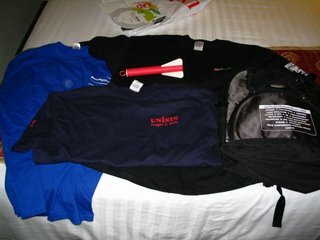 Check was very smooth, they gave us backpacks with all the books and CDs and info. It took less than 2 minutes to check in. We had 2 hours til the keynote started, so we headed to Chevy's Fresh Mex and had way too much food. The keynote was not bad, but it wasn't much new stuff. Scott Guthrie (ASP.NET team) and Mike Nunn (formerly SQL Server PM, now on Visual Team System) gave keynotes. Scott talked about building Atlas apps, but gave basically the same demo that is on the Atlas asp.net page. Mike Nunn talked about SQL Server and its integration with Visual Studio. He demoed CLR integration w/ SQL Server, which has greatly improved since the beta. Last time I looked at it, you had to jump through hoops to get it to work. Now you create a project, add some code and click Deploy. He also showed some Business Intelligence capabilities, which I will have to check out later. It was way high level and I didn't really get the use of it. After the keynote, they had a dessert reception. Lots of desserts, a bar and vendors. We had a free drink ticket, thankfully, cause beers were $5. We walked around and collected swag. Score so far: 3 t-shirts and one of those rockets that you pull the string back and fire from your finger (see the image). I know there will be another free tshirt from MSFT tomorrow and they are giving away a Harley, several tablets and other goodies. I'm done for the day. I'm going to call my A and Z and then hit the bed. Which track are you going to? ASP/VS/SP/SQL?